STORRS - Before Napheesa Collier takes the court for the UConn women’s basketball team she has a little pep talk with herself. And, really, has the Huskies’ senior ever been better than she is right now? Collier had 30 points on 12-for-16 shooting from the floor, 14 rebounds, six assists to no turnovers, and three blocked shots in 31 minutes Saturday as No. 5 UConn rolled past Temple 109-74 in American Athletic Conference action before an announced sellout crowd of 10,167 at Gampel Pavilion. 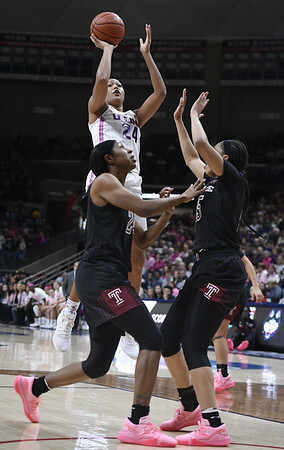 In her last seven games, a stretch that started with a 30-point effort against Temple on Jan. 19, Collier is averaging 23.7 points on 66.3 percent shooting, 9.4 rebounds, 3.9 assists with an assist-to-turnover ratio of 3.0, and 2.6 blocked shots. The St. Charles, Missouri, resident is second in the AAC in scoring to Temple’s Mia Davis at 19.3 and leads the league in rebounding at 9.9. She also second in field-goal percentage at 60.5 and in blocked shots at 1.6. “She’s putting numbers and stats that are just ridiculous,” UConn senior Katie Lou Samuelson said. “She has a good feel that she gets herself involved in every single play. It’s really important for her to keep doing that because we need it more than ever. Collier, a consensus first-team All-American in 2017, has emerged as the leading candidate for AAC Player of the Year honors (she shared the award with Samuelson two years ago) and is gaining attention on the national campaign. But Collier is a quiet one, though her actions speak loudly. Posted in New Britain Herald, UConn on Sunday, 10 February 2019 21:48. Updated: Sunday, 10 February 2019 21:50.